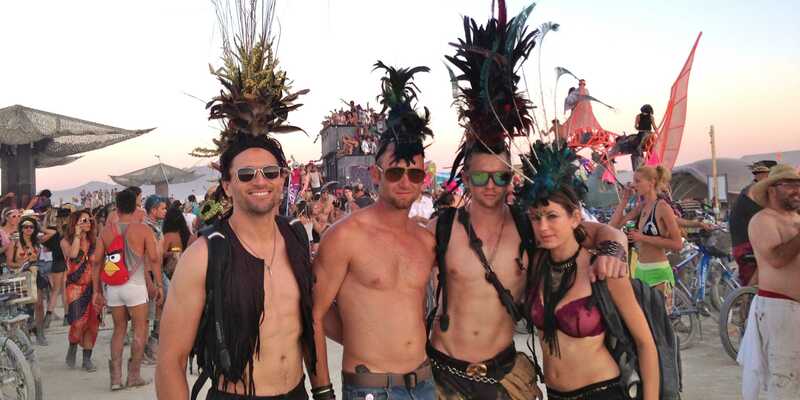 While most talk about New York Fashion Week, I’ll talk about last week’s Burning Man 2014. Burning Man is an arts festival that takes place the whole last week of August in Black Rock City, Nevada. This festival functions under 10 principles, one of them being “leave no trace” which means that once it is all over, everyone should clean and pick up their space, leaving the dessert as it was. Another one of their principles is the “liberty of expression” and “radical inclusion”. This may apply to the art you practice or whoever you are, you are totally welcome and they will make you participate, whether you like it or not, no matter how you look, dress or think. That’s the magic of Burning Man. No matter what part of this wide dessert you are, there’s always going to be people who will greet you, hug you or invite you to spend some time together. The individuality in each and every person is what caught my attention. Nobody is afraid to show who they really are. Yes, it is very different from what we normally see, but the level of acceptance and originality here is incredible, not only from the people, but also from the art pieces that surrounds them. The art at Burning Man most of the time has a message of love, acceptance and in protest of many problems concerning today’s society. For a better look at what is Burning Man, here’s a video they did last year of the poem “Oh the Places you’ll go” from Dr. Seuss. Here you’ll be able to see the people and art that forms part of this festival. After all, all these people have a couple of things in common: individuality and the love for art. Estaré poniendo fotos del Burning Man 2014.